Contest closed, congratulations to Melanie Taylor for winning! I thought it would be fun to play a little game today. 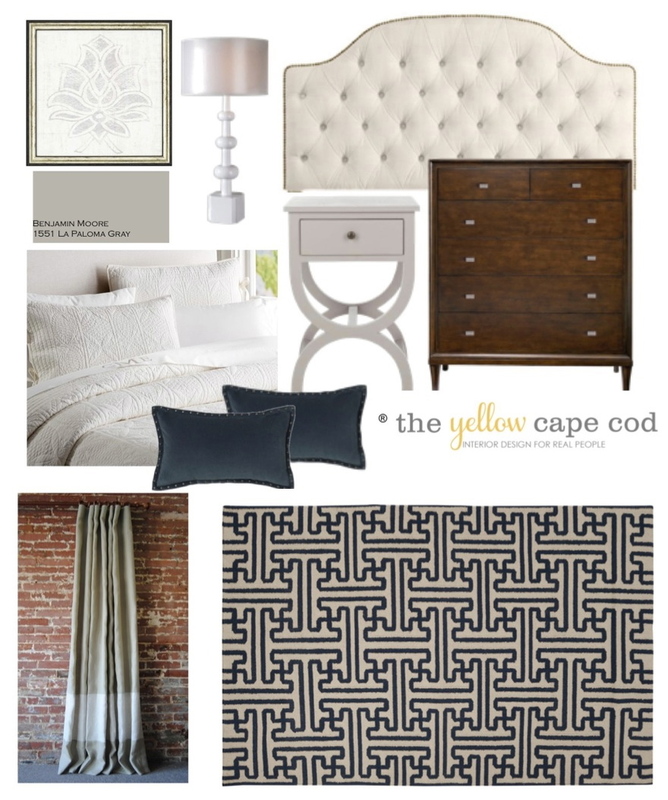 In this online design plan project for Kelly's Master Bedroom, we gave her two different rug options. At the end of this post, play along by guessing which rug Kelly chose for her new bedroom. 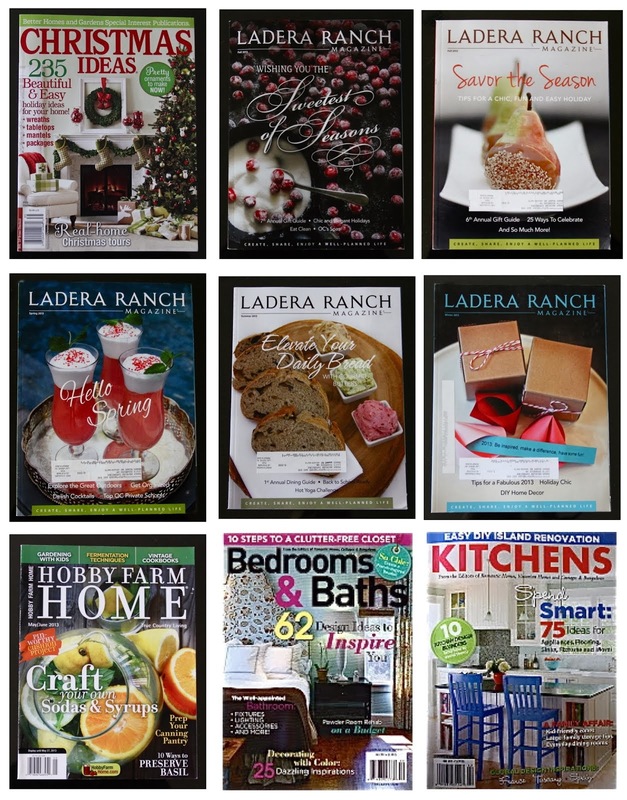 A winner will be randomly chosen from those who take a guess. The winner will receive a special gift from my shop (one of these). 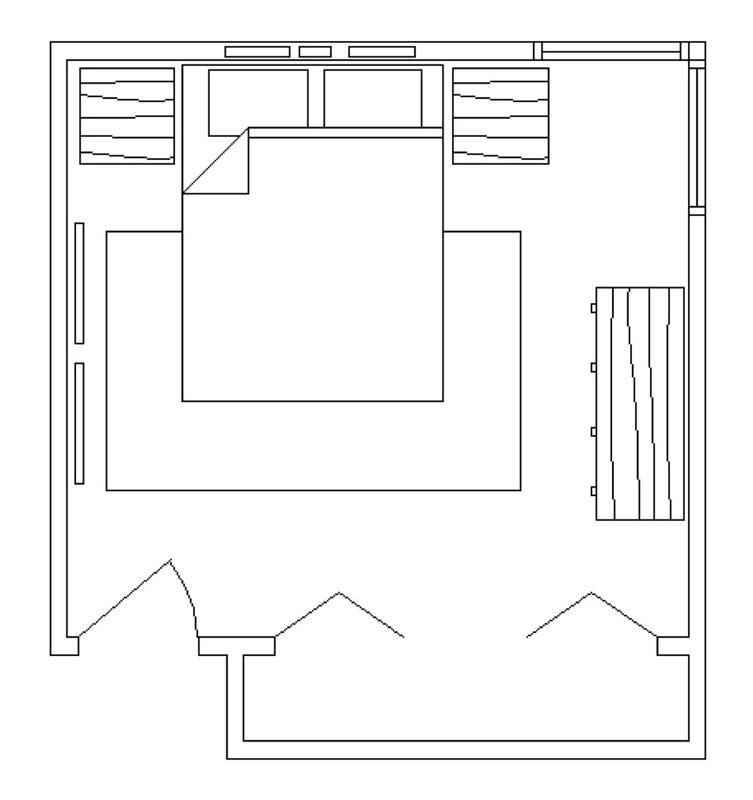 Above is the true to scale floorplan illustration of the room with all of the new items we recommended. We went with a soft platinum and cream color scheme with accents in navy. Both rug options we gave her bring a little of the accent color to the space. (both rugs are available in my shop). 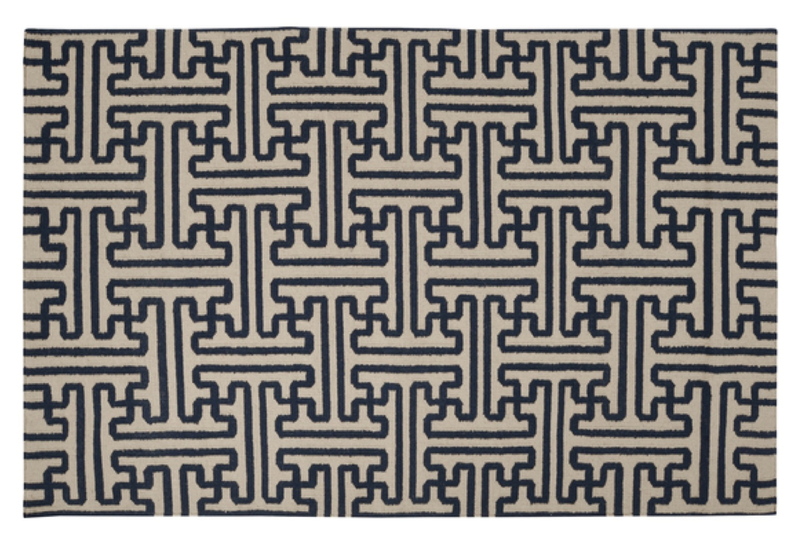 This Navy/Gray Medallion Wool Rug has a ton of personality. Soft gray end tables flanking the bed have a beautiful curved shape that softens the room. 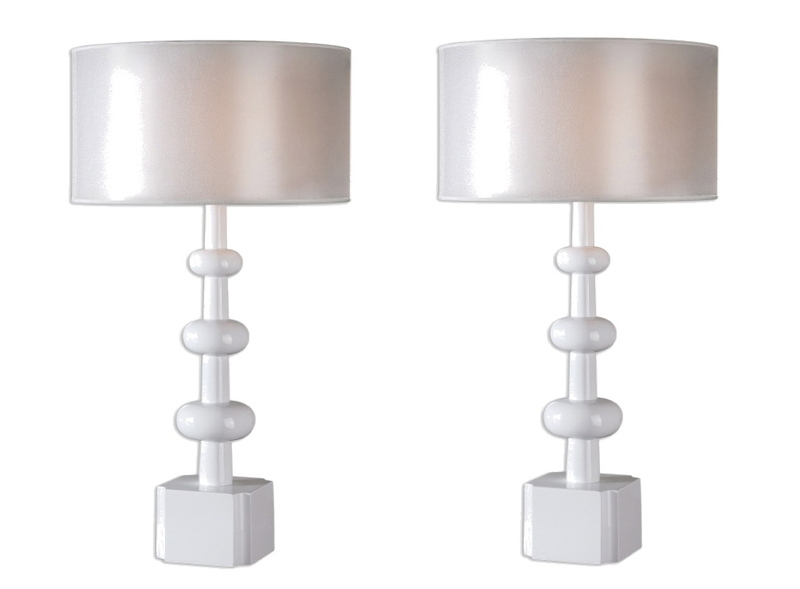 A pair of large scale glossy white lamps with a gorgeous double layered shade add a bit of luxury to the space. This wood toned dresser is an amazing compliment to the cool platinum, cream and navy color palette. There is much more to this design plan. 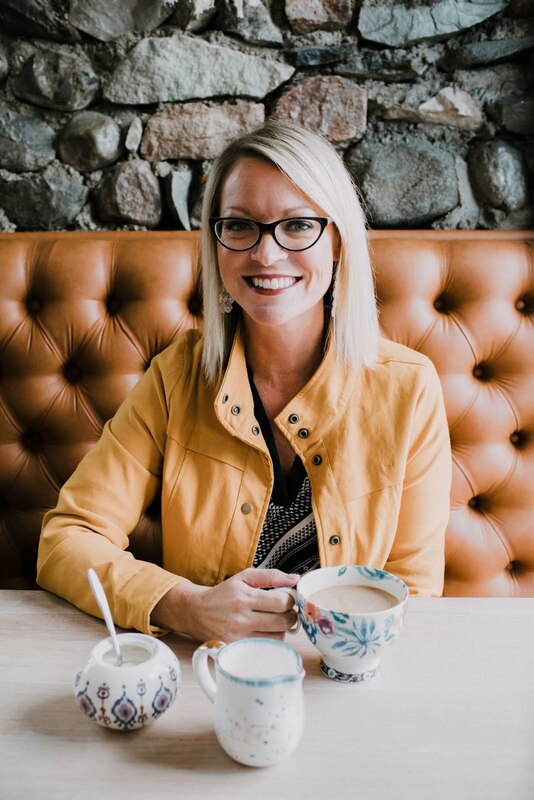 In addition to the information shared in this post, Kelly also received a complete product source list, custom paint color recommendations and step by step instructions on how to implement her new design. ARE YOU READY TO PLAY NOW? WHICH RUG DO YOU THINK SHE CHOSE? Leave your guess in the comments and you will be entered into a drawing where one winner will be chosen randomly. The lucky winner will receive one of these from my shop. Winner to be announced tomorrow. 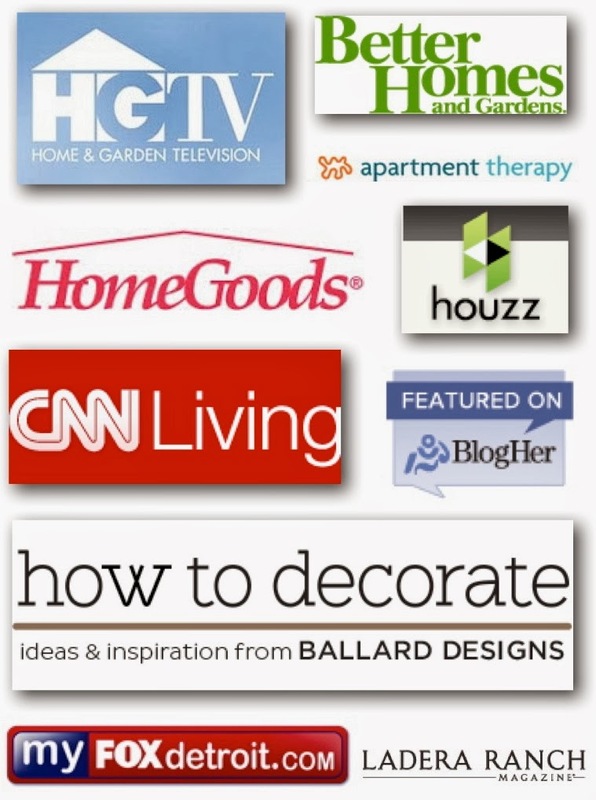 For information on my affordable online design consultation service, please click here. While either choice would be an interesting accent to the room, I think she chose #2, the geometric. That's the one I'd have picked. Option#1!! That's the one I would choose. Its softer feel for a bedroom. I would go with #2 myself...it's beautiful. Well, if it were me, I would choose rug #1. So, rug #1. Option #1. Softer feel for a bedroom. I think she chose option #1. Option 1 is my guess, but I love both! Option 1, but I love both! #1 -the navy and gray medallion. Love it! Option #1 - navy and gray medallion. Love it! Love both choices, probably would choose 1 for that room! Tough choice, but I will go with rug #1. I would so choose the large medallion. Lots more interesting. Option 1.....a little less trendy,....will last for years! Option #1. I love the look for the bedroom. I hope she chose Option #1 the Medallion Wool Rug!!! At least that would be my choice! Option #1. Perfect for a bedroom. Option #2 I adore geometric designs. I think #1!! Or at least, it's the one I would pick. I think Option # 1. At least that is what I would choose. I think she chose option #2. Oh I hope she chooses #1!! Love it!!! I am going to say rug #1...it's what I would choose! I vote rug #1. I LOVE the pattern! Option #1. I love it! 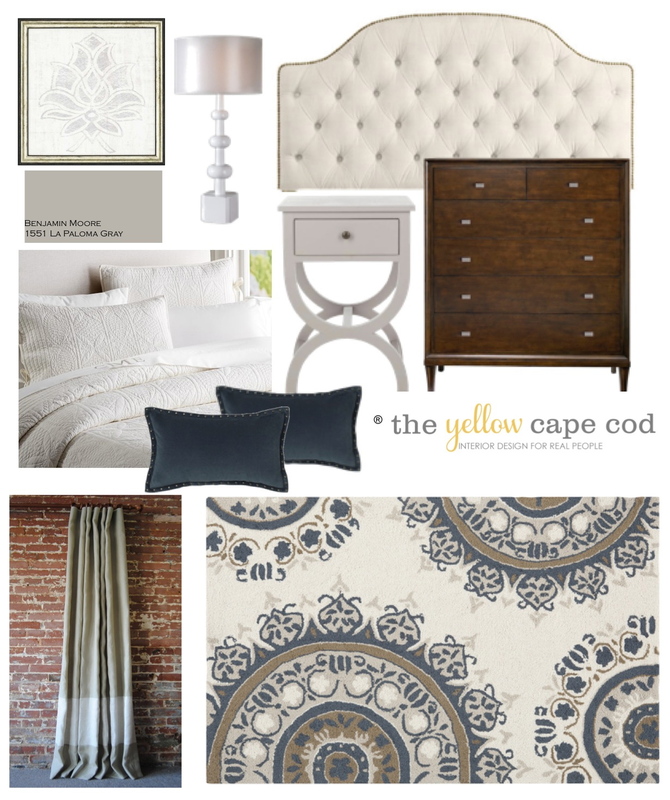 I love #1 because the Carmel color in the rug looks great with the nailhead trim on the headboard and the artwork. The rug pulls everything together! Looks great!! Love both rugs but my choice would have been #1, the gray/ navy medallion rug. I agree with the othe other posters that it's a softer look for a bedroom. I'm going to guess she went with Option 2 but I love them both! Rug #2. I would have chosen #2 especially if she did the white bedding. #1 for me as well. That is the one I like. Either way, her new room is going to be so pretty. Option #1........because I love all the colors in it. I'm going with option #1. Gorgeous! I'm going with option #1. Gorgeous!! I think she chose option #1, the medallion rug. Number 1! at least, that is what I would choose! I think she chose Option #2! Option #2. At first I chose the other but after considering the other elements decided that there were already quite a few soft lines in the room. Also I liked the way the pattern echoed the throw pillow shape and the lines of the dresser and draperies. Option #2 The room already has quite a few soft lines. I also like the way the pattern echoes the shape of the throw pillows and the lines of the dresser and draperies. #1. I LOVE that rug!! #1. I LOVE that rung!! I love both of them but I'm going with the bold #2!!! I love both of them but I'm going with the bold #2!!! It'll make a statement. I think she chose #1 for a serene calming effect! Option #1! Both are nice, but I like the soft shapes the medallion adds! I would select option 1 - I love the design and the print continues the curves and other circular elements in the room. PS: Love the color scheme and that navy becomes the pop of color. Option 1, I love it! Option 1? That's what I'd pick anyway! Ha!! Option #1. So calm and soothing - perfect for a private getaway. Definitely Option #1! 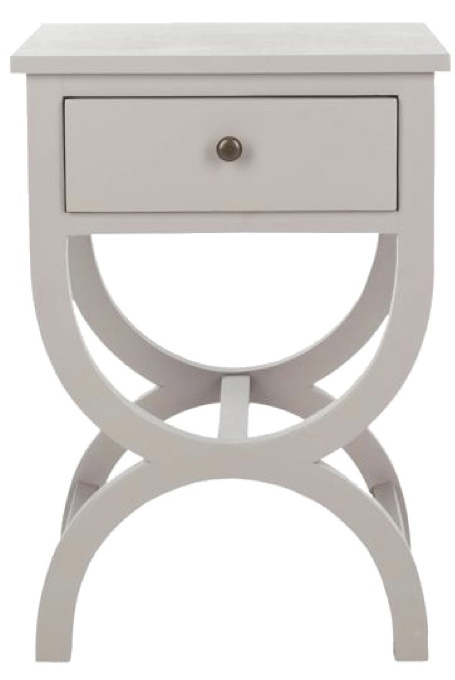 I love the movement of the medallions... they compliment the curve of the nightstands, plus like the extra color! Love them both, but I hope she chose Option #1! Option #1. I think I squealed when I saw it!!!!!! I like them both, but I like #1 a little better. I am going to say Option #1. Very pretty! Option 1! Beautiful, soft and stylish! 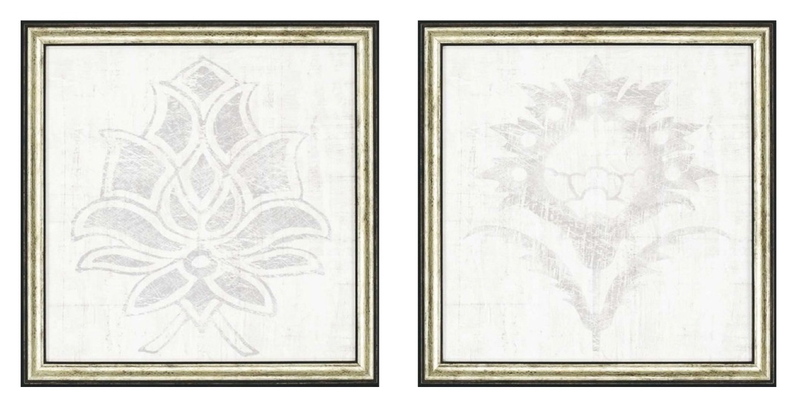 I love them both, but think Option 1 will add more personality to the room. Option 1! It's beautiful and soft, the perfect relaxing background! With style to boot! She chose the first rug! Option 1! Both would be beautiful though.. Probably option #1 because of the color pallet and large scale curving design that mimics other design elements...however, I would choose #2 because I really like the classic graphic punch it brings! Option 1....... I love that rug!! If I were Kelly it would be option 1. Option #1. I love the way the shapes reoccur in the various design elements. option 1 ... love it! Since everything else in the room is so quiet, I think the medallion rug is the way to go. Personally I love them both and I would choose the 2nd one for myself. 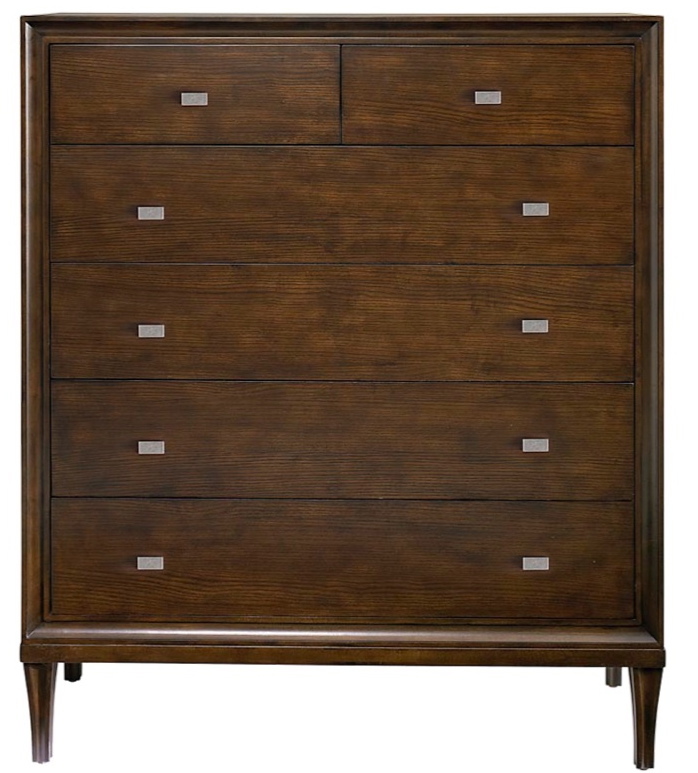 Option #1, because it incorporates all the colors, and the curves mimic the shape of the nightstands and lamps. I can't wait to hear what she chose! Absolutely love Option 1 - that's my guess! Option #1. I love how the shapes repeat throughout the various design elements. Navy/Gray Medallion Wool Rug. So nice and warm. Navy/Gray Medallion Wool Rug. Option #1. so nice and warm. They are both so beautiful, Sarah, and complement the furniture lines. Wow! #1 seems to be the most restful. Love how it caries out the soft flow of the colors and feel of the other soft accessories. I guess I'm going to follow the crowd and go with #1, the medallion. But, I tend to lean traditional. If Kelly has more contemporary tastes, she probably chose #2. They both complement the room and furniture choices so beautifully. Wow! I would have such a tough time choosing, but #1 seems a bit more restful for a bedroom. Can't wait to see which she picks! I would choose the 2nd option - the navy flat weave wool - so I'm gonna pick that one!! 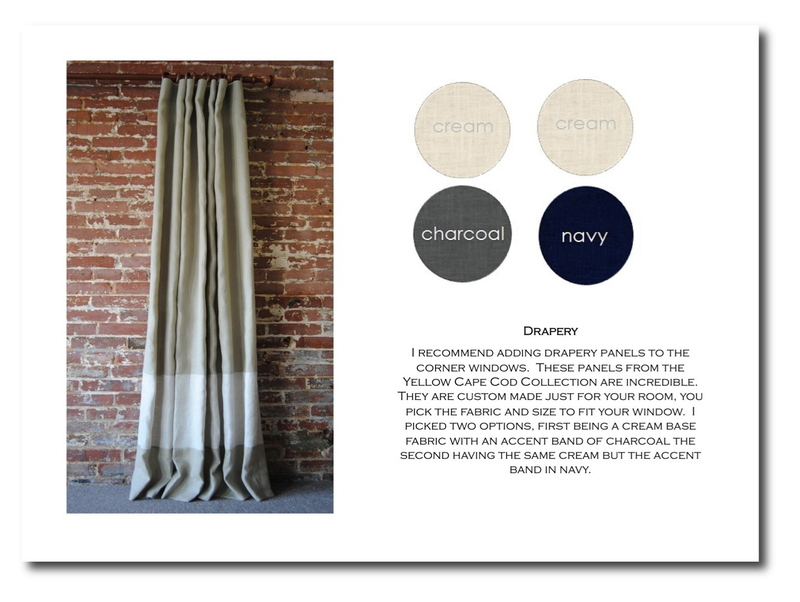 I would have chosen the 2nd option - the navy flat weave wool - so I'm gonna pick that one! Hope I win something from your shop. Love your goodies!! Option #1 - the Navy/Grey medallion one. 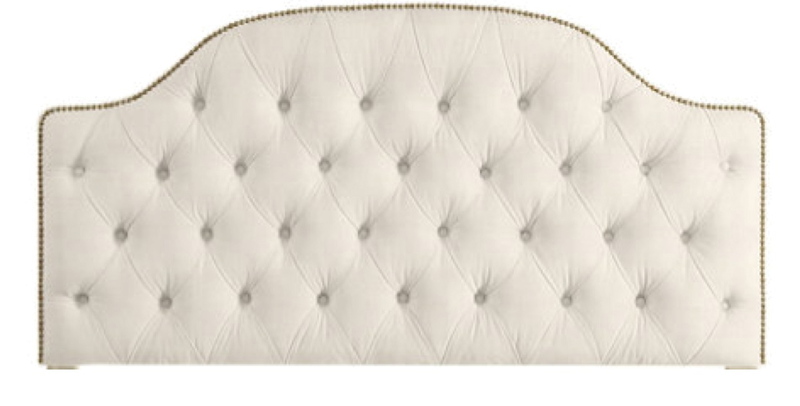 I love it to and want it for my master bedroom!! I love all the colors in rug #1. Option #1!!! It is beautiful and I want it for my master bedroom too! I think option 1, it's my favorite! I hope she chose Option #1 - so elegant and peaceful to the eye and everlasting in design. I personally would have gotten very tired of option two quickly - too fidgety for me. The first option, the medallion rug. That is the one I would choose. I think option # 1, the medallion rug. That is the one I would choose! option #1...it is timeless, it is the one i would choose. The Navy Flat Weave, option #2, is my choice. It would look great in almost any room. Option #1. Very soft and inviting. I hop she chose option #1. That's what I would choose. #1? Hard to say without seeing the floors, or knowing their style but I think #1 is a bit more interesting...same colors but with more tones for depth. Rug Option #1. Now, keeping my fingers crossed for the throw that will match my bedroom perfectly! The first one - it looks more girlie to me. They're both beautiful, though! I believe she chose #1......love it! Option 1 my choice and I hope hers. Option #1. I liked it a lot, too. Option ! I love the softness the rug brings! Both are beautiful by the way!!!! Option #1. That would have been my pick but both are amazing! I love Option #1, so that's my guess. Gorgeous rug! Option 1 suits the softness of the other items in the room. Love the suzani pattern! I think she picked RUG OPTION #1 NAVY/GRAYMEDALLION. I love the pattern and colors in that rug! I think she picked RUG OPTION #1 NAVY/GRAYMEDALLION. I love the colors and pattern in it! #1 is my favorite so I will guess that. I think she will opt for #1! I think she chose B(2) but I would like A(1). That was fun!! I think she chose Option #2 but I would choose #1. That was fun!! I really like rug option two but I'm going to say one because of the curved legs on the side tables! Oooh. I like this game. I'm going to say #1....just a hunch. This is a fun game!!!! I'm going with option #1...just a feeling! I think she'll choose #1. That's the one I would pick! Both are nice, I would choose option one! 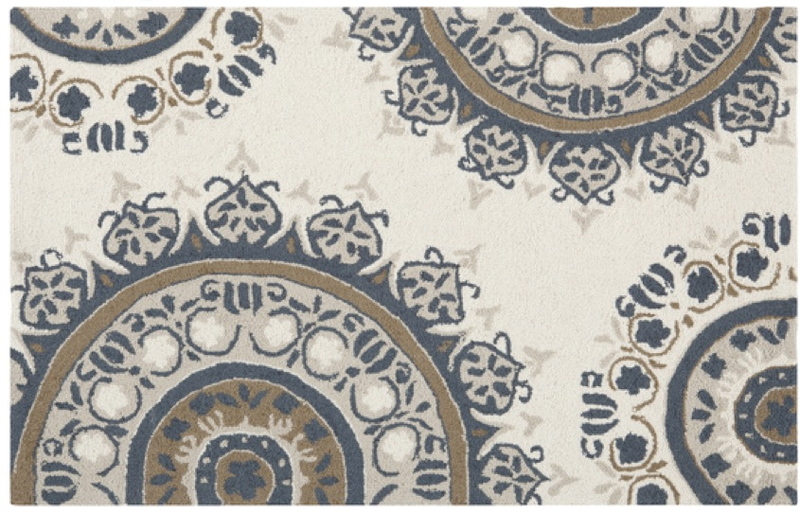 I would pick RUG OPTION #1 NAVY/GRAYMEDALLION. I like that there's more than 1 color. I hope she chose No. 1. I think it repeats the pattern in the art work. I think Kelly chose option #1. It looks like it will make the room feel warm and relaxing. hmmm.....I guess Option #1. It seems more comforting & fun. Rug #1, the navy gray medallion rug. Option 1! Has more color! Beautiful! Option 1 - Navy/grey medallion, that's what I'd pick for myself! Option #1, the navy medallion rug. Option 1 is the prettiest one. I hope she chose that one. I think she chose option 1! Love that rug! Oh, gosh they're both lovely... I'm guessing Option #1. Thanks for letting us play along! Option 1 Navy/Gray Medallion. Both are beautiful rugs. Can't wait for the reveal. Option 1 Navy/Gray Medallion. Both rugs are beautiful. Can't wait for the reveal. #1 would be my guess! I love option #1 I hope she chose this one to pull her colors together. Can't predict which she would like, but I'd pick no.1 if this was my room. Love the colors, and how the pattern echoes the other curves in the design. Besides, it's classic motif will stand the test of time. I would pick #1 for sure, but I feel she will choose #2. Lovely bedroom! Rug option #2 !! Great contest ! The first rug option - I would LOVE to see photos of the completed project :)! Option #1! Great choices and I'd love to see photos of the final product! Love them both, but I think she chose #2. I love everything about Option 1, so I choose that-I hope we get to see it all come together either way! I am going with Option # 1. Although I love both of them. Board #1 the medallion rug. I guess that Kelly chose the navy flat weave rug....classic design! Rug number two looks more fun. I'll go with that. At first I thought 1 but after looking at again, I'm going to say option 2, it gives it a more modern feel that complimets the rest.